The Coen Brothers are, for me, film-makers who chronicle the absurd and the arbitrary. Their films feature ordinary folk living ordinary lives, taken up by Chance and led into crazy adventures.The protagonists may well be eccentric - and often, superficially, have crazy hair - but they have nothing on the people they meet and the circumstances they encounter. In the early films, Chance manifested itself in a kind of dark, absurd, comedy. The protagonists were put through the ringer but ultimately were set down back in their homes, happy and well. But of late, the Coen Brothers' films have taken on a darker tone, and become almost obsessive with the arbitrary nature of Chance. NO COUNTRY FOR OLD MEN, following directly from the novel, goes to black mid-sentence. The message seems to be that after all this cruelty, all this killing, there are no answers, no justice, no meaning. A SERIOUS MAN is similarly nihilistic. It's a film filled with search for meaning, typically religious meaning, but ultimately it holds no answers. A good, if complacent man, suffers the torments of man and nature. Why? There isn't a why. It was, then, with some surprise that I learned that the Coen Brothers were adapting Charles Portis' True Grit for the screen - a novel whose over-arching theme is "You must pay for everything in this world, one way and another". For, at the most basic level, True Grit is a story about a young girl in late nineteenth century rural Arkansas, who hires a mercenary to help her get revenge on the thief that murdered her father. And at a more complicated level, it's a story about the sacrifices that those who seek to punish must make. The heroine, Mattie Ross, pays dearly for her single-minded obsession with revenge, but even her associates, Rooster Cogburn and LaBoeuf lead diminished lives as a result. Punishment is meted out to all, and in direct proportion to their crimes and faults. This is not, then, the world of arbitrary justice so often depicted in Coen Brothers films. The Coen Brothers' adaptation of the book is faithful - as faithful as their adaptation of No Country For Old Men - and far more faithful than the 1969 film starring John Wayne, Glen Gampbell, Kim Darby and, in smaller roles, Robert Duvall and Dennis Hopper. In this film, the voice of the narrator - Miss Mattie Ross - comes undiminished to the screen, and it's no surprise to see that it's Hailee Steinfeld, the young girl playing that character, who has the best of the dialogue and the pick of the award nominations. It's a gift of a role. In the book as in this film, Mattie is as particular as any Coen Brothers character. She's a teenage girl with a cool head for business, a strong religious sense of right and wrong, and a determination beyond her years. She weighs everything according to its cost and brooks no opposition. The funniest scenes in the film come early on, as we see wily adults try to fool her or dismiss her, only to be taken to the cleaners themselves. The lawman she hires, Rooster Cogburn (played by a wonderfully grizzled Jeff Bridges), comes to respect her after initially trying to shake her off. And even the vain Texas Ranger, LaBoeuf (a wonderfully funny Matt Damon), overcomes his initial frustration and distaste to feel affection for her. But Mattie is warned early on by a local lawyer that she will pay dearly for this stubborn determination, and as we see the movie's final scene and epilogue we can see that that has been the case. But we get no sense that she regrets her actions. She knew the cost, and accepted it. Her sense of justice is as cool whether concerning herself or her father's murderer, Tom Chaney. And that's the message of the novel and the film. True Grit is to do what you feel is right, but to look unflinchingly at the consequences. And when it comes to steadfast courage, Mattie beats the men she hires hands down. The resulting film is a work of the highest quality and quiet strength. It's not as superficially provocative or quirky as many of the Coen Brothers' films, and because of its thematic material and lack of spectacular haircuts, many reviewers have dismissed it as being "not a Coen Brothers film". My view on this is that the Coen Brothers have become so reknowned for delivering films with rapier-like dialogue, superb acting performances, stunning cinematography (typically from Roger Deakins) and great scores (here, Carter Burwell), that viewers and reviewers have become complacent. It's as if the machine is so well-oiled that it is taken for having been effortless, or even banal. To my mind, this is utterly wrong-headed. 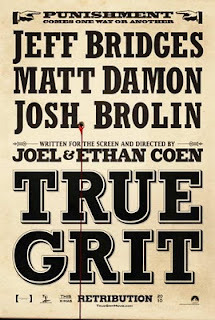 TRUE GRIT is a kind of pantheon film - a film in which every part of the whole - lead performances, supporting performances, photography, design, editing, dialogue - blend seamlessly into a profound and affecting whole. No individual component stands out and attracts attention in the way that Javier Bardem's character did in NO COUNTRY, but the completed work is truly a thing of great art and craft. To my mind, TRUE GRIT is simply the best film of the cinema year 2010-2011, and has been woefully underplayed during the awards season. It is being drowned out by more populist or more self-consciously dramatic fare (THE KING'S SPEECH, THE SOCIAL NETWORK and BLACK SWAN). But, foolish as it is to make such predictions, I believe that TRUE GRIT will stand the test of time far better than those, still very admirable, films. Quiet quality does not often get rewarded, but look at any aspect of this production and tell me it isn't first class. 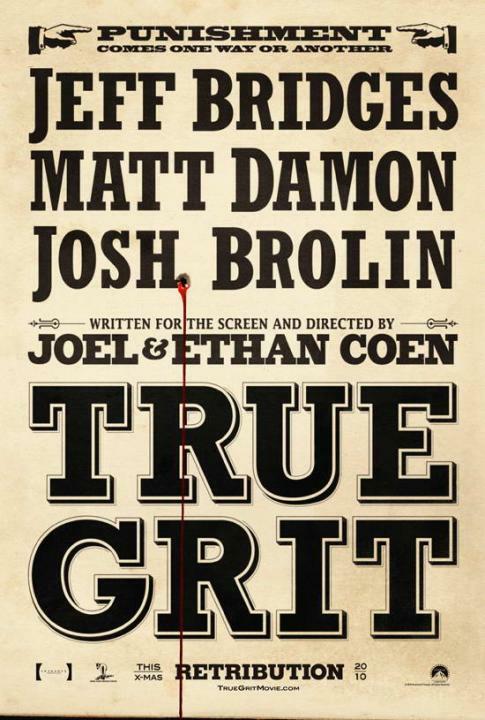 TRUE GRIT opened last year in the US and Canada. It is currently on release in Norway, Australia, Mexico, Argentina, Kazakhstan, the Netherlands, Peru, Russia, Brazil, Iceland, Panama, Poland, Spain, the UK, Venezuela, the Czech Republic, Denmark, Greece, Hungary, Kuwait, Portugal, Slovakia, Slovenia, Estonia, Finland, Italy and Sweden. It opens next week in Belgium, Egypt, France, Germany, Hong Kong, Malaysia, Singapore, Bulgaria, Romania and Turkey. It opens on March 18th in Japan. I was disappointed by the last 5 minutes of the film, I think they should have just had the voice over of Mattie speaking and not had the grown up version acting, I felt it spoilt it somehow - made less of the tragedy of the child. I agree it diminishes something but I think that's the point. True Grit is a movie that undercuts every expectation we have of a Western. The little woman doesn't need protecting by the strong men: rather she has the real strength. The West isn't wild and Romantic but harsh and inhospitable. Roger Deakins' desaturated photography, and the ignominious living arrangements of Cogburn are cases in point. At the end of the main part of the film, the audience has been given some sentimentality to cling on to: LaBoeuf comes through and a strange friendship has been established between the three. And then we get an epilogue that basically pulls the rug out again. No sentimental ending. Mattie grows up plain and stunted: physically and emotionally. There is no sweet syrupy closure. I love the truth and brutality of that. True Grit is entertaining at times, with good moments of inspiration, but coming from The Coen Bros. I couldn't help but be a little disappointed expecting something new and inventive. Good Review!